THIS IS THE WAY THE WORLD ENDS. FOR THE LAST TIME. A season of endings has begun. It starts with the great red rift across the heart of the world's sole continent, from which enough ash spews to darken the sky for years. Or centuries. It starts with death, with a murdered son and a missing daughter. It starts with betrayal, and long dormant wounds rising up to fester. And it ends with you. You are the Stillness, a land long familiar with catastrophe, where orogenes wield the power of the earth as a weapon and are feared far more than the long cold night. And you will have no mercy. A new fantasy trilogy by Hugo, Nebula & World Fantasy Award nominated author N.K. Jemisin. It's an awards controversy, with the group that's trying to rig the Hugos calling themselves sad puppies. Bob, I just read that post you linked to. I had no idea this controversy was going on! She's pretty awesome. The book sounds fantastic and I'm 100% adding this to my wish list Summer. I love visiting your blog. Oh holy crap, yes, I need this book! I think it's been on my radar for the better part of a year now. Possibly more than that. 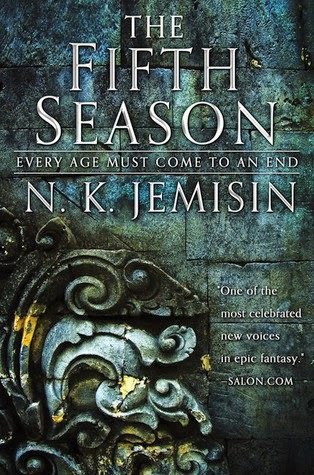 Either way, it's Jemisin, so I can't wait to read it! I know - I had it on my most anticipated list for last year, but it kept getting pushed back. Fingers crossed, this new date seems pretty firm. It always takes me a bit to get into her books but I always end up enjoying them in the end. Ohhh that sounds interesting! Hope you enjoy it! This is my first time hearing of this book. It sounds really good! I hope you enjoy the book! Check out my WoW! That Hugos stuff is buuuull. I was so, so angry when I read a post by that novella guy, who shall remain nameless. Hopefully, the upside will be that authors such as Jemisin and others will get recognized even more. This new book of hers sounds quite interesting. I hope you enjoy it!